Peter Southwood was intrigued by this rather odd looking animal he photographed at deeper dive sites. He contacted Dr. Charles Griffiths of the University of Cape Town zoology department, who passed it on to Dr. Gary Williams, of the California Academy of Sciences. 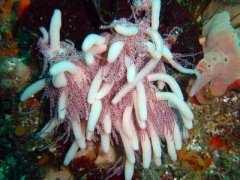 Equally puzzled, he believed it might be a new species of hydroid, even tentatively giving it the name of "rastafarii", as requested by Peter. 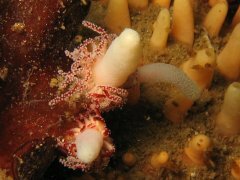 Gary Williams and Charles Griffiths researched the literature more, using Gary's suggestion that it is a hydroid, and they have come up with a very likely candidate. 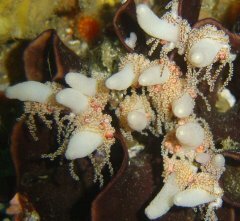 It is called Myriothela tentaculata, and has been described from a single specimen dredged up from 43 m near Slangkop. Specimens have been sent to Gary for confirmation. Since then it has been spotted on deeper dive sites all along the Cape Peninsula and False Bay, as well as in Port Elizabeth by Georgina Jones.